With public spending on police and social services collapsing amid Brazil's worsening economic crisis, violent crime has crept back up in Rio de Janeiro, a city widely recognized for its favelas - urban hillside slums teeming with violence, drugs and prostitution, according to Bloomberg. The decree is still subject to votes in both houses of Brazil's Congress, but is widely expected to pass as crime and stability become the No. 1 political priority of many Brazilians. The move, the first of its kind since Brazil returned to democracy in 1985, is a response to growing demands ahead of the October general elections for a crack down on crime and violence. It may also provide an excuse not to vote an unpopular pension bill, because by law changes to the Constitution can’t be made while a military intervention is in effect. Indeed, Lower House Speaker Rodrigo Maia said the decree that would be put to a vote in both houses of Congress over the next few days would make a vote on the pension reform more difficult. The government still lacks the votes needed for the bill investors had hoped would put public finances back on track, Maia said. “It’s an extreme moment and this is a very serious decision,” Maia told reporters in Brasilia on Friday morning. “Under those circumstances, that’s the way to reestablish order,” he said in reference to a growing sense of insecurity. But shootings and robberies aside, the intervention will provide an opportunity for Temer - who was famously caught on tape talking with a Brazilian businessman discussing the accepting of bribes in the wide-ranging "operation carwash" - to do something more vital to his political future. 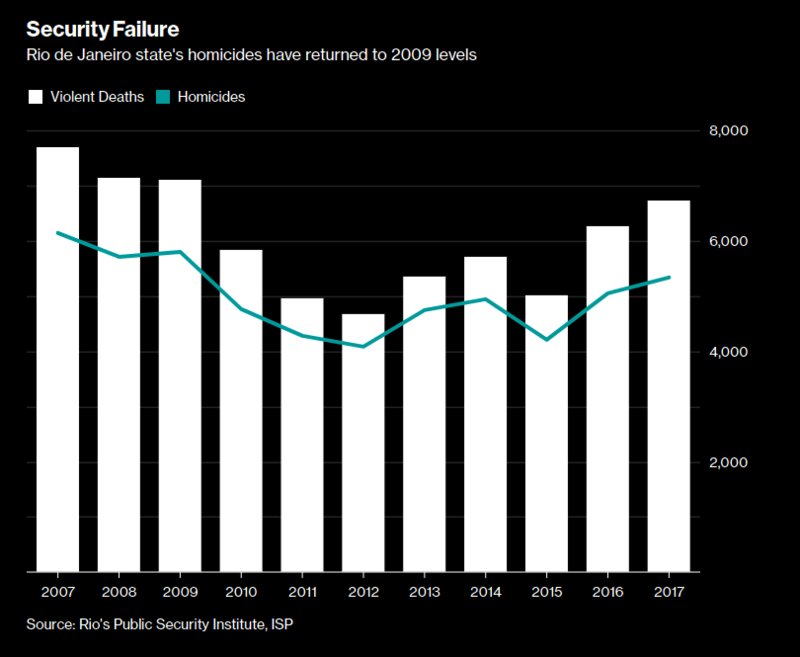 Violence and crime have been soaring in Rio de Janeiro in the aftermath of a deep recession that has left the state lacking funds to invest in its police, and to pay salaries. Public opinion surveys show security to be among Brazilians’ main concerns ahead of the October presidential elections. Jair Bolsonaro, a Rio de Janeiro legislator and former army captain with a hard line against crime, polls second. Shootings and mass robberies plagued Rio during the recent Carnival celebrations, when scores of tourists visit the city. Rio de Janeiro Governor Luiz Fernando Pezao admitted the state’s security has failed and asked for federal help, according to local media. The rate of violent deaths in the state jumped to 40 per 100,000 residents, the highest since 2009. Brazil returned to democracy in 1985, after 21 years of military dictatorship, and intervention remains a sensitive topic in the country. The worst of Brazil's economic collapse - which brought the Brazilian real to record lows - is likely behind it. But as the country recovers from years of economic and monetary policy mismanagement by Temer's predecessor, former President Dilma Roussef, who was impeach and removed from office, maintaining stability - particularly in the urban slums - will be paramount.